How do we know what products to offer you for affordable prices, exceptional beauty and greater garden success? We’ve been at this a few years. 76 of them, to be exact! From a few humble newspaper and radio ads for tulips and glads, all the way back in 1943, who’d have known we’d blossom into the great direct-mail garden company we’re proud to be today? Through the years, we’ve been honing our processes, our communications, our packaging, our selection… Use our experience to give your garden a head start! We make it our mission to deliver quality plants and bulbs at fair prices. You’d think that’s every direct-mail gardening company’s thing, but with smarter strategies and extra effort, we’ve been making it happen for 76 years. How? We keep a lean operation. We do the legwork—partnering with reputable growers worldwide, traveling all over to seek out the best performing, most unique and useful plants at low prices—and we pass along the savings to you. We take advantage of unique offers and deals to help you achieve your garden goals without breaking the bank. Whether it’s a new home or a new passion, gardeners just starting out can make the most of their landscape with Starter Plants, and our expert-designed, easy-care Garden Kits. Even professional gardeners agree that our Super Bags are a terrific value. We use bundle savings to get you more high-quality bulbs and plants to fill out the big display at an affordable price. We'd never get in the way of inspiration. Place an order with us whenever you like, and we’ll ensure it is sent to you at the correct time for planting in your zone (if you’re unsure what grows in your zone, check out our Zone Finder). Then, when it’s time to plant, instead of racing your neighbors to a big-box store, you can head straight to the garden—where you’d probably rather be, anyway. We have more info on when, where and how we ship your order to you on our Shipping Information Page. Once your new items arrive, check out the insert for planting instructions. If you have additional questions, see our Garden Resources, or contact Customer Service. Our mission is to provide reliable, affordable bulbs—helping gardeners of all skill levels create the garden of their dreams. We’re achieving that with a blend of unbeatable home-gardener favorites, and exciting new additions whose unique, conversation-starting looks and heaps of useful qualities are sure to energize any landscape. Maybe you want to save the bees, or create a fragrant oasis to wander through on the weekends. Maybe you just want to cover an uncomfortable view into your neighbor’s home, or you hope to set your home apart from the rest on your block. You can quickly search our selection with our Easy Plant Finder, which lets you filter down by color, height, light requirements, handy qualities, garden uses and more. We all want a high quality, affordable, stylishly designed garden, but who has time to research and meticulously plan out the perfect garden design? Well, our experts, actually, who work closely with all our plants for a living. We were challenging ourselves to find new ways to help gardeners create a more satisfying, successful garden. We asked our experts to design a few landscaping ideas—and boy, did they! If you want a selection of plants that solves a particular woe or brings a certain benefit to your garden, like attracting butterflies or filling out a difficult shady spot, try our exclusive pre-planned garden kits. They’re packed with easy-care varieties in a coordinated and dynamic display, with a PDF planting diagram on each product page. They were created with some of our best performing and affordably priced varieties, and in a bundle, you’ll save much more than buying individual plants to create the same display. If you sign up for our emails, you will receive exclusive updates, email offers and gardening tips. Plus, you can join the celebration of our 76th year and enjoy anniversary specials! Keeping an eye out for our emails is the best way to ensure that you always have the latest deals from Michigan Bulb. You can also join our mailing list to get a free Michigan Bulb catalog each spring and fall. Each year we strive to create an even better selection of affordable, unique, useful and easy-care bulbs and plants for your garden—check it out and claim coupon savings on your spring or fall gardening. Follow, like, pin or tweet—if you want to chat about the best hobby ever, show off your #bloompics or see what we’re up to, connect with us on social media. You've explored our options, picked out your plants, and ordered… now what? If there’s anything you’re unsure of, at any time, we’ve got resources to help you out. Got questions about our process? Check out our Frequently Asked Questions. Ready to plant? See our Planting Guide, or (if you want to take it out into the garden with you, you can download it, too). 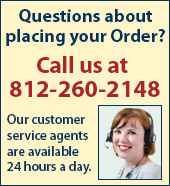 Plus, you can always talk to our Customer Service representatives, they’ll be happy to help.